This one is a Shabad by Bhagat Namdev that I composed in raag Shudha Basant earlier this year. Please share this with your hearts, your families and your friends. If you know any Marathis ... please share it with them as well. The beautiful words of Namdev are somewhat lost in his native state. Free streams of the shabad are available on Youtube, Spotify, and Pandora etc. Thanks to a request by my cousin I also uploaded a 30 second ringtone on Souncloud ... you can download that here. If you are generous enough to pay for the track, I will gladly donate the proceeds to the amazing musicians who mostly work with me on a voluntary basis. First, the word "Beethla" is used for God only by Bhagat Namdev in the Guru Granth Sahib. Contemporary Marathis will recognize the word "Biththal." It is interesting to note that the similarities between this word and "Beda", "Bohit", "Boat", "Bethel" and "Bethlehem". Beda means boat and occurs many times in the Guru Granth Sahib. We use "Kaljug ke bohit" in ardaas - implying the Guru is the boat in Kaljug. Boat is obviously a boat. Bethel is a hebrew word that means house of God, but one especially made for sailors. Every time we say the word "Beethla" we are reminded of Guru, the boat to God. The name of God is untranslatable. And there is special meaning of every name. Guru Nanak says, "God I love you in every one of your names." That is one of the reasons why, when I do my translations -- as you will notice in this video -- I keep the name of God that is being used unchanged. To really know what it means, one has to take a deep dive into Guru Nanak's Mool Mantra. Second, I especially loved the line "Lobh Leher At Neejhar Baajai" ... the bottom line is that Greed is bad. But how beautifully Bhagat Namdev says this. What an amazing group of words sown together. Lobh - Greed. Lehar - Wave. At - Very. Neejhar - Water fall (Just like PatJhar is Leaf Fall, Neejhar is Water Fall -- also called Nirjhar - where Nir is water and Jhar is fall). Baajai - beats. The waves of greed are beating the body of my soul (kaaya or body of soul is used in the next line) like a water fall whiplashing the body of a boat in a storm. What a beautiful way of describing how greed works. Another note on the raag, Basant. Sometimes during Basant, there are floods. This happened this year in California -- after more than a 10 year drought there was so much rains that it was flooding all over the place. So it was apt to sing this shabad. So there maybe 31 color of emotions (Raags) directing towards oneness in Gurbani, each color has several shades. This is a beautiful shade of Basant. This is Raag Shuddha Basant as per Sikh Musicologists. It is said that historically this was the more prevalent way of singing Basant (rather than the Purvi Basant that is mostly sung now). 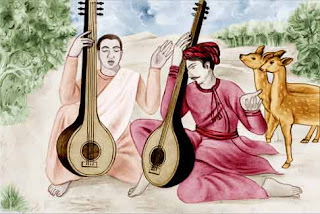 In Hindustani Classical music this raag is not called Shudha Basant; it is called Bhinna Shadaj (Hindustani musicologists have a different definition of Shudha Basant). My wonderfully talented little cousin from Delhi, Simer, did the cover for this -- you can see it on iTunes/Amazon etc. This shabad is dedicated to her. Much thanks and love you Simro! Lobẖ lahar aṯ nījẖar bājai. Ŧār lai bāp bīṯẖulā. ||1|| rahā▫o. Anil beṛā ha▫o kẖev na sāka▫o. Hohu ḏa▫i▫āl saṯgur mel ṯū mo ka▫o. Nāmā kahai ha▫o ṯar bẖī na jān▫o. Beautiful voice always love to listen.Sing more and make the world sing with you Shiv. Love your voice.